In my year of concentrating on reading more theology, some of these shorter books (See Ryrie, A Survey of Bible Doctrine in the January issue) serve as great refreshers and reminders of important doctrines. This is a 1965 edition from Pentecost, long-time professor of Bible Exposition at Dallas Theological Seminary. Pentecost is well known for many books including Things To Come and The Words and Works of Jesus Christ. 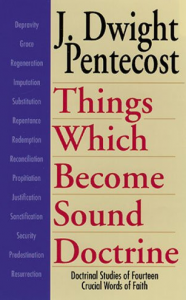 In this brief 159 page book Pentecost takes the reader through 14 doctrines: Depravity, Grace, Regeneration, Imputation, Substitution, Repentance, Redemption, Reconciliation, Propitiation, Justification, Sanctification, Security, Predestination, and Resurrection. Pentecost was an ardent dispensationalist and premillennialist. He was also a mainstream evangelical, even pastoring Grace Bible Church in Dallas during his teaching years. By today’s standards one might think such a position would allow for a certain slackness in Christian living. I find, however, that earlier evangelicalism promoted holy Christian living in a way often forgotten in many evangelical circles today. An example of this is his description of New Testament grace.